The deportation process begins when you are served with a Notice To Appear. 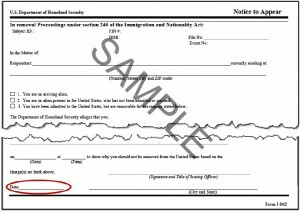 You can be served with a Notice to Appear through mail or being served personally, though the latter usually only happens if you have been subject to an immigration arrest by Immigration & Customs Enforcement or local law enforcement. 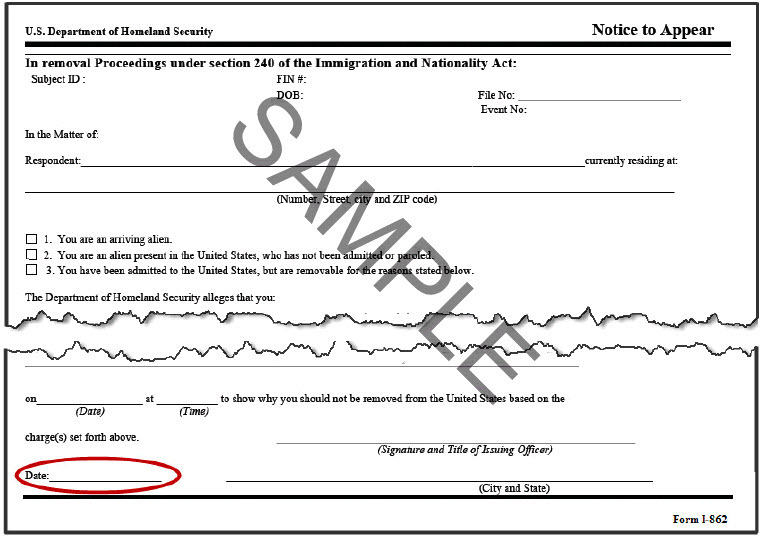 A Notice to Appear is the first formal document that tells you that you are being placed in deportation proceedings. What will happen if you do not appear (most often, you will be declared removable in absentia, or while not present, and any ICE agent may arrest and deport you). At least ten days are required to pass, by law, between the receipt of an Notice to Appear and the first hearing. This is to give you time to find an attorney and prepare for the hearing where you have the opportunity to present what defenses to removal you may qualify for. Learn about the next step: Master Calendar Hearing.